It may not surprise anyone to learn that people in my family often get pin loomed presents for Christmas. It's after Christmas now so I won't be ruining the surprise by sharing some pictures and ideas with you. You have probably guessed that the Mug Rug part of the combo is our own favorite 4"x 4" pin loom square. 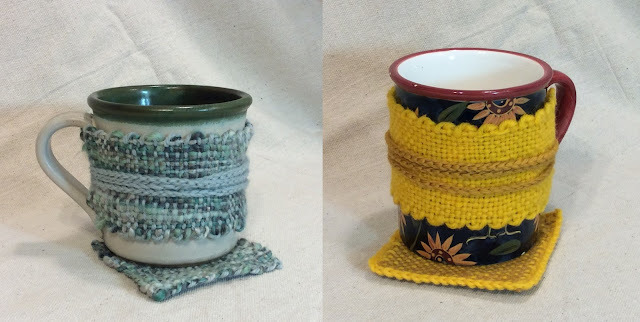 The Mug Hug aspect is a new pin loom project that I have been experimenting with. I have found that it is both easy and fun to make pin loom rectangles on a fine gauge sock knitting loom. 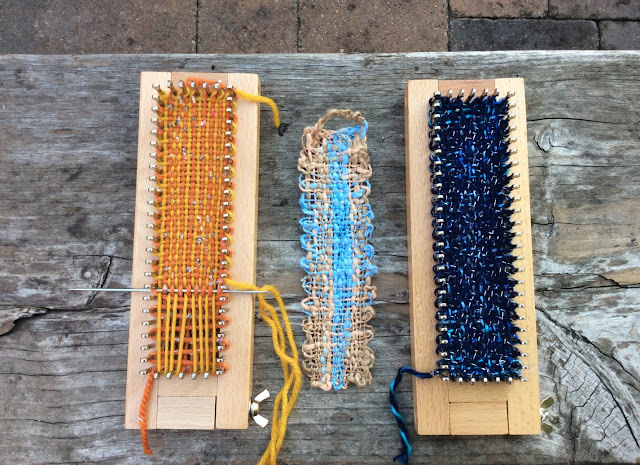 Here are some examples of weaving on the sock knitting loom. You'll notice that the one in the middle has a loop crocheted on the end, these were woven and designed as fiber cuffs. You may have also recognized the loom, its a fine gauge adjustable knitting loom. Which means that it is not only possible to weave rectangles for mug hugs and fiber cuffs, its possible to weave rectangles in a bunch of different lengths all on this one loom! 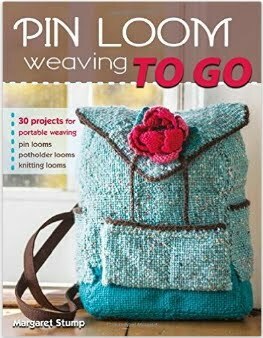 Which brings me to the second part of the story, that the newest book on pin loom weaving, Pin Loom Weaving To Go, will be available in March, 2017. 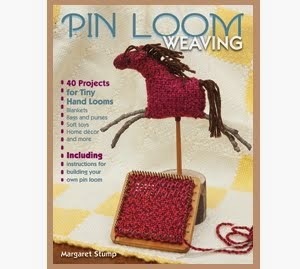 Pin looms have always thrilled me. I love their ease and portability. I love the fact that each square is complete in itself, that when you take them off the loom they don't ravel or unwind. In Pin Loom Weaving To Go we will explore using that same pin loomed approach to weave on a sock knitting loom and on a regular old potholder loom. But in each case you will be able to weave a completed square that pops off the loom without the need for any type of locking edge. I am really excited about this book and I hope you enjoy it too! I ordered a copy of your new book based on how much I enjoyed the first one. Will you be able to give us a peek inside of some of the projects? I will definitely be posting information on the projects in the book. I am hoping to put together a video to give everyone a look at the items. Cant waite to learn more!! !